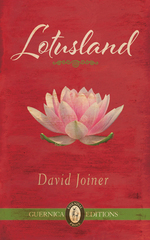 Garry Craig Powell recently sat down with David Joiner, author of Lotusland, for an interview published by Rain Taxi. Powell begins by stating, “with its complicated cast of characters and evocative settings, Lotusland is likely the most vivid novel set in post-colonial Southeast Asia that contemporary readers will encounter”. Powell asked Joiner a few questions about the inception of the novel, to which Joiner replies “I don’t know that a specific idea led to the inception of Lotusland, but I do remember wanting to fill a niche in U.S. literature about Vietnam. I wanted to set my novel in contemporary Vietnam, during the time that I was writing it, and have it turn the page on the war we fought there”. The story of Lotusland hinges on the various deceits of the novel’s characters, and “the conflicts come about because there are serious issues of trust”. Joiner explains, “one needs to be rather careful there both in business relationships (as with Anthony) and romantic ones (as with Le and Huong). After all, legal protections in Vietnam hardly exist. Also, Vietnamese people in general distrust their government, the police, and others in positions of power. That distrust often filters through to everyday relationships, which play out dramatically in the novel”. That said, Lotusland avoids giving a one-sided representation of Vietnam. Instead, as Powell emphasizes, “Lotusland is a rich and textured portrait of the country…that reveals both the worst things about it – the corruption, the poverty, and the tawdriness – and the best: the beauty, not only of its landscape and art, but often glimpses of transcendent beauty in quite ordinary scenes, as well as the humanity of the people, their present sufferings and their brave attempts to overcome the trauma of ‘The American War’”. When asked about Joiner’s particular aesthetic approach towards writing Lotusland, he states “setting is important to my aesthetic…I’ve always been fascinated by, even moved by, both the natural and urban landscapes of Vietnam. It’s kind of a wabi-sabi ethic, where one finds beauty in the potential of things, in their imperfections. To me, no other country possesses the kind of beauty Vietnam is endowed with, and because that beauty, that aesthetic, really can’t be replicated in the West, I need to paint scenes with a certain type of brushstroke to ensconce readers in the place itself”. Even though Lotusland focuses strongly on Vietnam, and the conflicts between the characters stem from issues with Vietnam’s social and economic conditions, Joiner maintains that “Lotusland develops certain universal themes – love is one, finding one’s place in the world is another, learning to do what is morally right is one more”. Lotusland tells the story of Nathan Monroe, a 28-year-old American living in Saigon who falls in love with a poor but talented Vietnamese painter. After failing to protect their love from her desperate chase for a better life in America, Nathan is hired by his old friend Anthony to work at his real estate firm. Only much later does Nathan discover that Anthony has intended all along for him to take over his job and family so that he, too, can escape and start his life over in America. David Joiner was born and raised in Cincinnati, Ohio, but has since made his home in nearly 20 different cities across the US, Japan, and Vietnam. David currently lives in Kanazawa, Japan, where he is working on a second novel set on the Mekong River in Vietnam and Cambodia. His earliest experience in Vietnam was as a volunteer teacher in 1994, when he became the first American since the end of the Vietnam War to live and work in Dong Nai province. Lotusland is his first published novel. Tagged with David Joiner, Garry Craig Powell, Lotusland, Rain Taxi.